Technology is in progress and evolve with the development of the era , events and methods are also developed with the progress and evolution of life which are changing day by day .Therefore , the media insight of our university goes with this phrase of changes, which included the areas of science and all knowledge. From here the university found the necessity of follwoing a progressive scientific approach that fit these variables and changes in order for our university to be in advance always scientifically. That is emphasized by the President of the University Prof. Dr. Alaa’ AbdulHussein when he met the Committee of media in our university and with the presence of Mr. administrative assistant professor Dr. Riadh Khalil Khamas with members of the media at the university, consisting of Prof. Dr. Abdulbassit Salman, Director of university channel office in our University and Dr. Ahmed Abdelaal, director of relations and media and instructor engineer Bassim Hamid Jrimd director of the website, to discuss the development and improvement of mechanisms media work and the Office of the university channel and the website of the University. The president has stressed the need to promote university to review the activities and events of the university through multi-media, and he stressed the need to address the intellectual and cognitive issues to be accessible to everyone through technology and the infrastructure of the university. The University President also stressed the updating of the published topics , news and scientific articles through the university media and the website or electronic technologies that are often formed a kind of intellectual progress in many of the developed world educational institutions., Mr. President has praised during the meeting, the role and work of the university channel ,Department of Media and the website of the university and stressing at the same time more work for the best by adopting of scientific and objective approach in media work, through available technology, and also work on finding mechanisms of letting the channels enter our university according to the traditions , principles and standards that govern the work. Dr. Riadh Khalil , the Administrative Assistant of the university president has discussed during the meeting the work of the university media, emphasizing the technological side of the media in dealing with intellectual or academic issues that concern our university and the possibilities of making new and developed images that go with the modern developments and humanitarian progress, which found an urgent need to support the media continuously in order to communicate with the world progress to give the best results. Dr. Riadh has also stressed to follow non-traditional methods in our university to address the dissemination and communication in general , so that the university be in accordance with the continuous development of the work in accordance with the potentials of the university, especially the nature of the size and the wide area of the university over other universities in Iraq and the Middle East. Mr. President has briefed the views of the Committee, where Prof. Dr. Abdulbassit Salman, director of the university channel’s office in Baghdad University, has explained the need for institutional work of the media and the professional approach as befits the size and reputation of our honoured university , representing a rate of approximately 43% of the reality of education in Iraq , and that work in the media does not end, especially at the Office of the university channel that now covers a large proportion of the activities and it is expanded the tasks and works in order to be in the other colleges, institutes and departments and formations of the university, he also explained that a media revolution will be launched soon with the university’s efforts and ongoing initiatives in the development of the work of the university as a preparation to launch the channel of Baghdad University in the future, and that readiness is in full swing to prepare officials in each college , Institute and the formation of the university to establish a planned course that will be set up soon. The university president has listened to the views of Dr. Ahmed Abdel-Aal, director of relations and media, who has explained the importance of media work and coordinated it in according to the scientific approach within the specialized mechanisms so that the results will be distinctive, stressing that the media work is qualitative and quantitative at the same time, but quantity must dominate to feature our university with the rest of the universities and also stressed the developmental ways of all workers of the media in non-traditional media methods. As he has explained the need to expand the work of the university channel Office by producing multiple specialized programs at the university as innovations, creative and excellent programs and also stressed the need for coordination on reporting Department of media early and directly of all the activities and events of all academic departments and colleges and their cooperation in communication, as well as the importance of creating an objective and practical mechanisms , he also has listened to the viewpoint of the website director , instructor engineer Bassim Hameed, who explained that the world is evolving and progressing within the fast pace and the efforts of multiple global developments accompanied the media, science and technology, as the contact in the world is witnessing the work and the stability reflected on various aspects is fixed to evolve and get better day by day . The president also has emphasized at the end of the meeting to keep communicating and discussing the developments . The website team has followed the meeting and documented it with a set of photographs . Because of the movement of a number of colleges to Al-Jadiriya complex and the numbers of the staff and reviewers are increasing day after day, which would require an urgent need to find new outlets and multiple gates for the entry and exit of students. With these consequences a concrete small bridge that connects the university with Al-Karkh directly through Lake of Al- Jadiriya is the solution. The university has sought to achieve this important small bridge which will ease the traffic on many areas of Baghdad, not only the University of Baghdad. 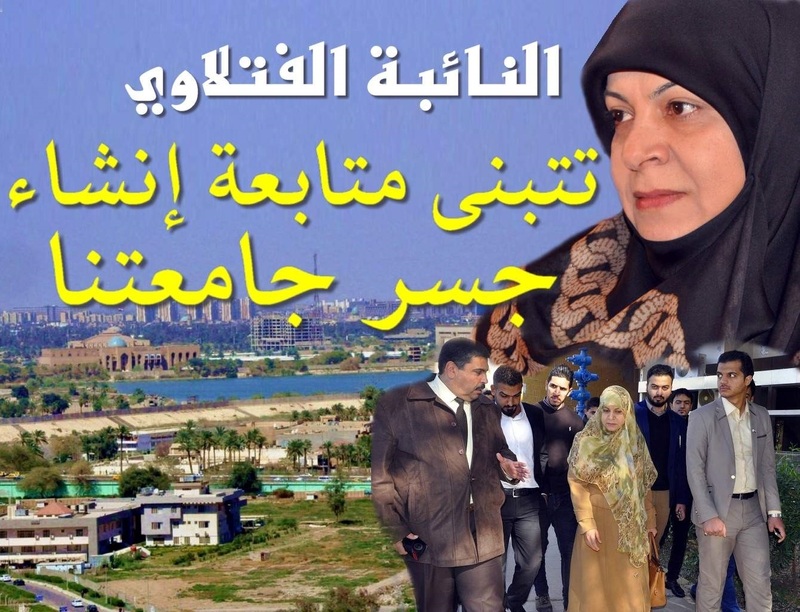 Where the university has put the designs and plans , but the project did not conduct for many reasons.Today the MP doctor Hanan Al-Fatlawi adopts this important small bridge through her personal follow-up with the Municipality of Baghdad and the Ministry of Construction and Housing. Then she has paid a visit to our university including the colleges of Engineering and Agriculture in Al- Jadiriya complex, to get to know and look at the scientific level in the university .She was accompanied by the Scientific Assistant of Scientific Affairs Assistant Professor Dr. Osama Fadhel Abdullatif and instructor Engineer Bassim Hameed Jreimid ,director of the website of the University, and Mr. Dean of the college of Engineering Prof. Dr. Ahmed AbdulSahib Muhammad Ali who was the first to receive her and Associate Dean of Administrative Affairs Dr. Haydar Makkiya and Associate Dean of Academic Affairs Dr. Amal Al-Saidi. The MP has made a tour in the Department of petroleum Engineering and has seen the conditions of the students and their studying needs , and after a discussion with some students and faculty members , the MP Dr Hanan Al-Fatlwai has adopted the supplying of some requirements in coordination with the Ministry of Oil for scientific laboratory devices that effectively contribute to the development of the scientific level of the student and the University .She has also listened to the opinions of the students and their problems and has promised to find appropriate solutions as much as possible. After that she went to the College of Agriculture and Dr. Shaker Al-Attar, Dean of the College of Agriculture has received her with his Assistants and a number of the heads of research units .The MP has conducted a field trip in the college and has seen the buildings and departments .The Dean of the college has initiated a speech on the foundation of the college and its development with the most important obstacles faced by the college in the beginning and its achievements that are made shortly . The students at the university has greeted Dr. Al-Fatlawi with great hospitality due to her great popularity in the Iraqi Parliament , and her explicit and objective views . The scientific Assistant , Deans of Engineering and Agriculture colleges have thanked Al- Fatlawi for her interest with students and education. She has thanked all attendees expressing her full readiness in supporting any humanitarian project that serves the society or the educational movement. The University website has accompanied Dr. Hanan Al-Fatlwai and has documented the visit with a set of photographs . President of university of Baghdad receives the Iranian cultural adviser and his accompanying delegation. A study at the university of Baghdad discusses market economy and its effects on Iraqi environment and resources. Al-Khwarizmi college of engineering arranged a scientific visit for students to Southern Baghdad electric power station. College of Veterinary at the University of Baghdad Holds a scientific symposium about Ebola disease and its relationship with the human and animal. Dean of Genetic Engineering at Baghdad University Gets New Patent for Extracting “DNA”. Al-Kindy college of medicine organizes an extended seminar on the importance (OSCE) in medical examinations. A delegation from the college of agriculture participates in the 7th International exhibition of inventions held in Kuwait. An instructor from the college of arts wins the “2014 academic work award” presented by the Japanese foreign minister. College of engineering participates in a meeting of Arabic universities union in Jordan and honors its top students in all scientific departments. University of Baghdad gets the first place in the Iraqi universities championship in tennis. Center for strategic studies at the university of Baghdad holds a workshop on the foreign policy of Iraq towards Afro-Asiatic states. University of Baghdad discussed the adoption of a modern agricultural technology for production of strategic crops in Iraq. University of Baghdad reaches at a new technology in laser dental implants. Instructors from the university of Baghdad record thirty sequences of nitrogenous bases in the international database. College of medicine at the university of Baghdad organized a workshop on the development of medical education. College of arts celebrates an instructor who won the literary creativity award and organises a lecture entitled the university and the community. College of engineering discusses the possibility of opening modern laboratories and organizes a lecture on the use of smart electric meters in Iraq. College of engineering hosts a specialist from an international company and discusses the possibility of using batteries as alternatives to energy. 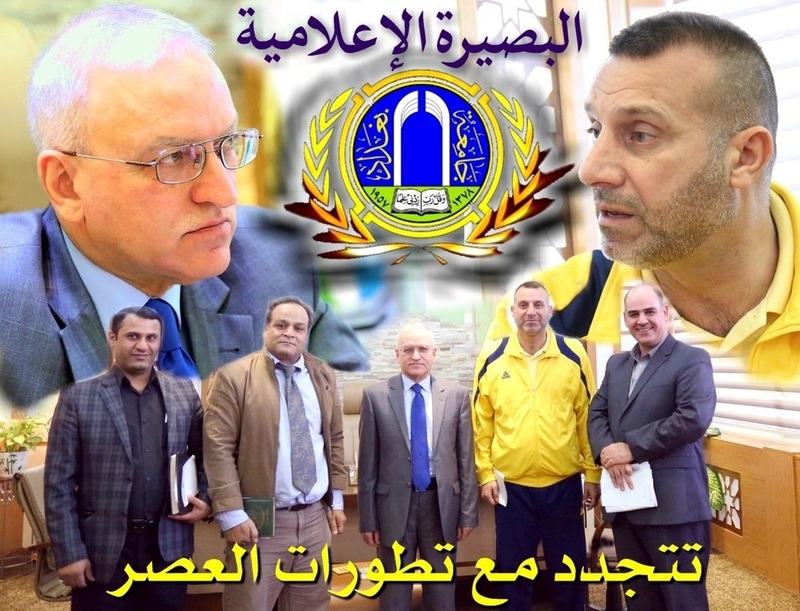 Administrative assistant of the president of the university of Baghdad calls for promoting and developing women’s sports. Department of university sports and art education opens the annual festival of the short film. College of veterinary medicine holds a symposium on Ebola.